Walking and running are great ways to work out, especially outdoors. Running outdoors is way more interesting than running on the treadmill and also offers a lot of advantages over exercising indoors. But unlike the treadmill, you have to do a little planning. To get the absolute most from your workout take some time to plan the perfect route. Sure, you could just head out the door, hit the pavement and go wherever the road takes you, but for the best results and maximum enjoyment, a little prior planning makes all the difference. Planning your route also helps you to tailor your route to suit your goals, to accurately determine the distance of your route, and avoid conditions that might aggravate injuries or health conditions. Also, having a few different routes can help provide some much needed variety which can prevent boredom – something with which even the most hard-core runner can suffer from time to time. 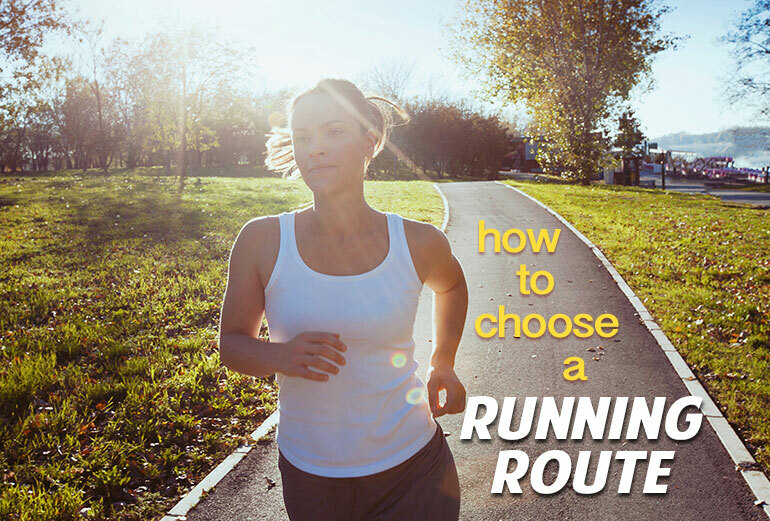 To create the perfect running or walking route consider these factors. DISTANCE. It pays to have long, medium and short routes planned so that you can match your workout to your energy levels and the time you have available. Too many runners simply do the same route and distance over and over again. If you want to get fitter or faster, you’ll need to push yourself further and faster on some days and take it easier on others – something best achieved with different running routes. RUNNING SURFACE. If you only ever run on the road or pavement, you are placing a lot of stress on your muscles and joints and it’s the same stress over and over again. For variety and the health of your muscles and joints, it’s a good idea to plan routes that take you over a variety of surfaces. Grassland, wooded trails, dirt paths as well as roads are all good running surfaces. Of course, if you are looking to run your best ever road 10K then you should stick to the pavement, but if you’re simply running or walking for health or general fitness, it really pays to mix it up. TERRAIN. Inclines can range from gentle undulations to seemingly never ending hills that end up feeling more like mountains. If you find hills a challenge, resist the urge to avoid them and incorporate a few manageable hills into your walking and running routes to ensure you get better at overcoming them. Hills provide a real challenge, so make sure you don’t overestimate your abilities and take on a hill that literally brings you to your knees or leaves wanting to curl up and cry – half way up. Instead, pick hills you know you can conquer and look for more challenging inclines as your fitness improves. TRAFFIC. The best way to avoid a road traffic accident is to avoid traffic as much as you can. And that means planning your route so that you avoid busy roads at peak congestion periods. Running through a busy city center can be very dangerous so, if you have to walk or run during rush hour, head for less travelled roads and do your best to steer clear from traffic. If you do have to exercise in traffic, make sure you are very visible and do your utmost to stay out of the path of traffic. Make sure you use your eyes and ears to avoid hazards. That means not cranking up the volume of your music player to drown out the traffic, or even better running without any music at all. POLLUTION. Pollution comes in many forms and while car exhausts are the most obvious and common, smoke from factories and even pollen from crops can be just as unpleasant. Do your best to plan your route in areas where fresh, clean air is abundant. If you do have to run in an area where any type of pollution is unavoidable, consider wearing an anti-pollution maskto block out fumes. OBSTACLES. Ideally, your walk or run route should be free of major obstacles to allow you to flow though your workout unencumbered. Obstacles tend to be more of an issue for runners than for walkers. Traffic lights, busy junctions, gates, stiles, fences, streams and rivers, stray dogs and other such annoyances make for a stuttering and vacillating run, instead of the smooth and flowing run you’re after. There is nothing more frustrating than having to run on the spot to stay warm while waiting to cross a busy intersection or missing out on a new personal best because you got held up at a pedestrian crossing. WEATHER. When the weather is against you, you may want to consider a less exposed walking or running route. Strong winds can make moving over flat, open ground very demanding and driving rain is no one’s idea of fun! Also consider how the weather can affect your running surface. Torrential rain can turn a pleasant dirt track into a quagmire of mud and deep puddles and ice or snow can turn a normally safe pavement into a treacherous ice rink. In general, if it is wet underfoot, roads and pavements are best. SPECIFICITY. If you are training for a specific event, your route should in some way prepare you for what you are aiming to accomplish. If you are going to be running in a very hilly event, you should make sure at least some of your training routes are similarly hilly. If you are going to be walking a long way over rugged grasslands and unpaved trails, that’s exactly the type of surfaces some of your training routes should incorporate. Doing lots of road running on flat surfaces in preparation for an off road mountain marathon wont prepare you adequately, so plan your routes accordingly. Having the right running or walking route can make your workout a lot more effective and also more enjoyable, which in turn means you’re more likely to exercise often and regularly, as well as reap some awesome results.